Doctor Tran Thi Thao Ly joined Cao Thang Eye Hospital as an ophthalmologist in 2014. Previously Dr. Ly worked at Hoan My General Hospital and at the ophthalmology department of District 10 General Hospital. 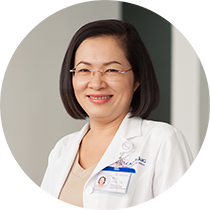 Dr. Ly received her medical degree from Can Tho Medical University in 2000 and completed a Specialist level I in ophthalmology (equivalent to a Master of Ophthalmology) in 2004 from the HCMC University of Medicine and Pharmacy. Upon graduation Dr. Ly continued refining her skills by completing a number of certificates and course. In 2013, she earned a certificate for Phaco surgery from the HCMC University of Medicine and Pharmacy. Recently, she has just finished the Laser Therapy course for Anterior Segment from Cho Ray hospital & Vascular Endothelial Growth Factor (VEGF) course from Ho Chi Minh City Eye hospital, both in 2017.